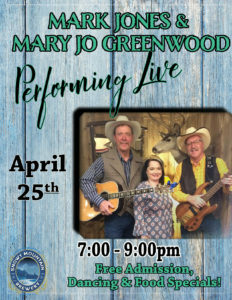 Mark Jones & Mary Jo Greenwood will be performing live on April 25th from 7-9 p.m. There will be FREE ADMISSION as well as Dancing and food specials all night long! Don’t miss out on some great music and a night of fun! Become a VIP Rewards member! Stumbled across this gem when we were traveling across the country. Peaceful Western rooms with natural hot spring pools just outside our room. Their pools were clean and the teepee tubs were private with incredible views of the night sky. Great dinner and breakfast — Had dinner there 2 nights and the elk was fantastic. Breakfast was also good in the mornings. You could go light if you liked or have a hearty meal before hitting the trails. The Silver Saddle is back! 2014 marks a great beginning for the Silver Saddle restaurant! Everything we have had was excellent from beginning to end. Great menu, good service, and exceptional food. Keep up the good work. We look forward to many more visits this year! Beyond Wonderful & Inviting! Peaceful western rooms with natural hot spring pools just outside our room. Hated to leave!!! Food and staff where excellent! I had chicken wings for appetizer’s and Elk steak for main course. It was fantastic!! The steak was tender and seasoned perfectly. I would recommend it to everyone.